By most accounts the process of economic reform in Cuba starts in 1993. In these six years this process has evolved in various directions, not all of them consistent with each other, and economic outcomes have also evolved in various ways sometimes due to the reforms and at other times despite the reforms. An evaluation of this process requires some brief background on both the Cuban economy and the nature of markets, which is provided immediately below. Afterwards, we will address two fundamental aspects of any reform process: What are the goals of the reforms? What is the impact of the reforms on economic activities in the two types of markets we identify below? With the Fall of the Wall in 1989, the Cuban economy went into a precipitous decline in economic activity, measured by GDP, which lasted until 1993. Since 1993 there has been increasing growth in GDP from 1994 to 1996, followed by decreasing growth in GDP in 1997 and 1998, see Pérez-Villanueva (1998, Fig 1, p. 2). Furthermore, the substantial decline of the early 1990s came on the heels of a deceleration in the growth of internal economic activity associated with the Rectification Process, Betancourt (1993). Indeed, some knowledgeable insiders have argued that the process of decline in the economy started in 1983, Roque Cabello and Sánchez Herrero (1998). We will argue that the 1994-1996 recovery was associated with policies that allow markets to expand and the decline in growth since 1996 is associated with policy measures that lead to a contraction in market activities. To support our argument, it is useful to review an essential point about the functioning of markets: these institutions can be split into two types according to the dramatically different role that the state plays in them.2 In the first type of markets, where transactions are self-enforcing, the state plays a limited role which can be characterized primarily as providing law and order and a medium of exchange. In the second type of markets, where transactions are not selfenforcing, the state plays a more pervasive but subtle role that has been labeled market augmenting government by Olson (1998). In addition to law and order and a medium of exchange, the state has to provide contract enforcement mechanisms in this second type of markets. The most typical and important among these mechanisms is an independent judiciary, but a host of other governmental and nongovernmental institutions also contribute to the functioning of these markets. Other institutions that support the development of the second type of markets include specific organizations, which supply arbitration, supervision and regulation services, as well as societal norms or rules of conduct, such as freedom of association and freedom of the press. For instance, freedom of association allows the creation of credit bureaus and better business bureaus that enhance the operation of reputation effects in generating the fulfillment of contracts. Similarly, freedom of the press allows the dissemination of information on successes or failures in the fulfillment of contracts. Moreover, both of these societal norms play an indispensable role in the transmission of knowledge as a public good that is intrinsic to the flourishing of many markets in innovations, ranging from AIDS vaccines to business formats. In general markets of the first type evolve on their own unless governments actively repress them, while markets of the second type are unlikely to exist or operate at a high level of transactions unless the fabric of institutions in a society, including governmental activities and policies, provides a hospitable environment. In evaluating Cuba’s “reforms” we will differentiate between these two types of markets and the effects of the “reforms” on their functioning. WHAT ARE THE GOALS OF THE ECONOMIC “REFORMS”? In many if not most countries, the process of economic reform has as its stated goal the development of a market economy. What happens in practice can take many forms, since capitalist countries offer a wide variety of alternatives under the so-called mixed market economy model. Nonetheless, the basic thrust of a move toward a market economy is paid at the very least lip service by the political or regime leaders of most economies in a transition. It is difficult to argue seriously that the goal of Cuba’s economic “reforms” is the development of a market economy. Fidel Castro repeatedly denies such earthly objectives. Indeed in January 1999, at a conference on globalization sponsored by the Cuban government, Fidel took pride in making two announcements: his lack of knowledge of economics and his belief in the imminent demise of the capitalist system. In any event, it is infantile to pretend that such public statements by the leader of a country are consistent with any serious attempt at economic reforms that develop a market economy, especially when such a leader enjoys the unlimited power over his subjects that Fidel Castro does. There are two countries where the objective of the economic reforms has been limited quite publicly and openly, namely Vietnam and China. In these two countries, the leaders have espoused the development of a market economy subject to its subordination to the preeminent role of the Communist Party in the political arena. Cuba is not following their path in terms of the public declarations of its highest ranking leaders, or more importantly in terms of the reform measures adopted.3 While in Cuba there are expressions of sympathy for what these two countries are trying to do and Castro visited both in late 1995, these sympathetic expressions are usually accompanied by statements that whatever reforms from these two countries are emulated, they do not imply a return to capitalism or a transition to a market economy. At the core of the Chinese reforms are two institutional changes, started from below and appropriated by the leadership, that dramatically altered the economic incentive systems facing the majority of the population: namely, the development of the household responsibility system in 1979 and the development of town and village enterprises in the 1980s. The former change eliminated an important element in the suppression of agricultural markets; the latter change made these enterprises residual claimants to the outcomes of their activities in an environment of interjurisdictional competition. These two institutional changes constituted a dramatic improvement in the distribution of economic opportunities available to China’s population. No set of “reforms” in Cuba provides similar economic incentives to the majority of the population. What are then the goals of the Cuban economic “reform” process? I would argue that it is the preservation of Castro and the nomenklatura in power, given as small a move toward a market economy as required for the survival of the regime.4 To buttress my argument I will rely on a Cuban economist from the island who makes a similar point, perhaps unwittingly. In his conclusion to a paper presented last Fall, Pérez-Villanueva (1998) argues that the strategic design of the future should aim not at survival but to the search for real growth alternatives, but adds at the end—logically this should be done within the framework of the system that has been set-up over the last forty years. The practical import of the caveat at the end is to generate a great similarity between his statement and mine. WHAT IS THE IMPACT OF THE ECONOMIC “REFORMS” ON ECONOMIC ACTIVITIES IN MARKETS WITH SELF-ENFORCING TRANSACTIONS? Perhaps the most important economic reform undertaken in Cuba has been allowing the U.S. dollar to be used as legal tender since 1993. This provides a most attractive medium of exchange for all transactions and for all types of markets, including markets with self-enforcing transactions. Just as most command economies in the past, Cuba provides reasonably high levels of law and order in the standard sense of limiting petty crime. Hence, one would expect markets with self-enforcing transactions to do well in Cuba. The most important among these markets in Cuba are the agricultural or farmers’ markets, the market for self-employment services, other legal retail markets such as dollar stores, the market for prostitution services and other illegal retail transactions. Self-employment was allowed in about 100 occupations in 1993, restaurants were allowed up to a limit of 12 chairs in 1994 and professionals were allowed to participate in self-employment in 1995, as long as it was not in the profession where they received their training. Since 1995 a number of repressive measures have been undertaken against these activities. A particularly telling example is the rental of rooms to tourists, which is now subjected to confiscatory taxation in the form of levying a tax based on a 100 percent occupancy rate over the year that has to be paid regardless of the actual occupancy rate. Not surprisingly, the number of registered and approved selfemployed peaked at 208,786 in December of 1995 and declined to 159,506 by January of 1998, Ritter (1998). Farmers’ markets (and artisan markets as well) were legally allowed in the Fall of 1994. The main suppliers of these agricultural products were expected to be the new agricultural cooperatives (UBPCs) and small farmers belonging to ANAP. More recently, an independent association of small farmers (ANAIC) who participate in these markets has arisen. The UBPCs have not been as successful as anticipated due to the restrictions under which they operate.5 For instance, they are required to sell given amounts to the state at prices imposed by the state, plant the crops recommended by the state, etc. After they meet the state procurement quota, they can produce for themselves or for the farmers’ markets. Their contribution to the supply of agricultural products in the farmers’ markets has been estimated as going from 15 percent in 1994 to 4.8 percent in 1997, Nova González (1998). An important restriction in the development of the farmers’ markets are the prohibitions of participation by intermediaries. In the immense majority of cases it is inefficient for small farmers to have to sell their products themselves at these locations, but there seems to be a fundamental bias on the part of the Cuban leadership against the role of intermediaries in this economic activity. Inveighing against these intermediaries became one of Fidel’s favorite pastimes at the beginning of the Rectification Process and continues unabated.6 Small farmers members of ANAIC have complained in 1999 of persecution by government authorities through news and articles by the Association of Independent Journalists that appear weekly in Cubanet <http://www.cubanet.org/centro. html>. In any event, the private supply of agricultural products to the farmers’ markets went from 42 percent in 1994 to 50 percent in 1997, Nova González (1998). A plausible interpretation of what is happening in the farmers’ markets is an attempt by the government to control the supply to the market without lowering output by agricultural producers, but this is a difficult trick to perform. For instance, Nova González (1998) reports that the share of supply of agricultural products provided by the government in these markets went from 24 percent in 1994 to 41 percent in 1997.7 Nonetheless, he also reports a decline in the total amounts of both agricultural products and meat products available through these markets in 1997. It is more difficult to assess what is going on in illegal retail markets or black markets, including the one for prostitution services. In the latter one, we know that an attitude of benign neglect prior to 1995 was replaced by a hostile attitude after a 1995 speech by Fidel condemning the activity. Complaints of harassment by the authorities in their attempts to repress prostitution surface periodically in Cubanet. Nonetheless travelers consistently report that the “jineteras” are plentifully available, especially in Havana. Last but not least is the dollar stores retail market controlled by the government. Direct information on these markets is not available. One reason may be that these markets provide an important mechanism for the government to capture dollars from several sources: the members of the population who receive remittances or who engage in illegal activities, tourists and any others who acquire dollars. For instance, by charging a high price in dollars for the commodities sold at these stores the government captures the difference between the sales price and the dollar cost of obtaining the commodity per unit. These dollar stores sales are likely to be partly responsible for an inconsistency that seems to exist in the official statistics. If one looks at the figures for retail trade provided in the Anuario Estadístico de Cuba for 1996, one finds that the highest rate of growth of retail sales per capita is the year 1993-1994, with the rate of growth declining in every subsequent year up to the last period for which data is available, 1996- 1997. The sales figures are in pesos per capita. These figures are inconsistent with the growth picture that emerges from the GDP statistics quoted earlier. Part of the explanation may be that sales in legal dollar stores are converted into pesos at the official exchange rate (1:1) rather than at the market exchange rate (about 1:20). Summing up, the policy measures adopted and the pronouncements made since 1995 would be expected to have serious negative effects on the functioning of markets with self-enforcing transactions and they have had precisely this effect. The only exception to this general assessment may be the dollar stores retail market where the government gets the lion’s share of the profits in dollars. WHAT IS THE IMPACT OF THE ECONOMIC “REFORMS” ON ECONOMIC ACTIVITIES IN MARKETS WHERE TRANSACTIONS ARE NOT SELF-ENFORCING? In this second type of markets one finds most of the markets that make up a modern economy, for example financial markets, skilled labor services markets, and markets for investments and innovations. Just as in other command style economies, these markets are relatively underdeveloped in Cuba. Reforms in these markets have focused on foreign investment and activities related to this sector. With respect to financial markets, there is little progress. There are no insurance markets or markets for financial intermediation. Banking is characterized by Cuban economists to be at a primitive level of development, Echevarría (1997). Even the proposal for banking reform put forth by Carranza, Gutiérrez and Monreal (1998) does not envisage that interest rates would play a role in the allocation of credit to state enterprises, which represent the bulk of the economy. Banking credit financed only 0.7 percent of investment by the state in 1997, Pérez-Villanueva (1998). With respect to the new nonagricultural private sector, which consists of wholly-owned foreign enterprises, joint ventures and a small number of “sociedades anónimas” controlled by the nomenklatura, these enterprises increased both their share of employment (from 2.2 to 3 percent) and the absolute number of workers (from 82,400 to 110,300) between 1994 and 1996, Anuario Estadistico, 1996. They have been called the star performers of the reform process by Ritter (1998). The same author, however, points out that Cuban nationals are not allowed to invest in them and that the outgoing payments for profit repatriation and interest on shortterm debt have now reached high levels which compare unfavorably to the actual amounts of annual foreign disbursements ($550 million going out versus $250 million coming in). Ritter (1998, p.18) goes on to question the wisdom of placing so much hope on foreign investment. Perhaps one reason for this strategy is that foreign investment provides an important mechanism for capturing dollars by the nomenklatura. An institutional arrangement that allows this capture is the requirement that workers in foreign enterprises be hired through the National Employment Agency. The latter receives payments for their wages in dollars and pays them in pesos! With the official exchange rate at 1$ per peso and the black market one around 1$ per 20 pesos, this agency has one of the world’s most lucrative businesses. Last but not least we should consider the state sector, which still comprises the bulk of the economy (77.7 percent of the employed labor force in 1996). “Reform” in this sector has been slow or nonexistent. The most recent thrust of the “reform” is to cut down the contributions of their losses to the fiscal deficit, at least on paper, through autofinancing. Nonetheless, the treatment of inter-enterprise arrears, limits on the use of profits and even what accounting practices are relevant is unsettled. Their interactions with the banking sector is also an issue of potential concern given the recent experiences with banking crisis in countries with weak banking systems. Interest in “reform” here seems to be driven by the hope that projecting an image of macroeconomic stability by reducing the fiscal deficit will attract foreign investment. Cuba has not made state enterprises residual claimants to their profits despite autofinancing and, thus, has not addressed the basic incentive problems of this institutional form. Interestingly, Pérez-Villanueva (1998) reports the state enterprises in the sugar sector as a main contributor to the fiscal deficit through their losses. Yet, Ritter (1998, pp. 16-17) in assessing the problems of the sugar sector writes, “In effect, it has been a foreign exchange cow which has been milked continuously with insufficient attention to sustainability.” The need to capture dollars for the nomenklatura gets in the way of even the very limited reform in the state sector. Cuba’s economic “reforms” are at a standstill or in clear retrogression and so are the economic benefits that the majority of the population could derive from economic reforms. This outcome is not an accident, but the result of a conscious attempt by the Cuban leadership to maintain absolute political control. It seems to have two basic policies in the economic realm. One is adopting economic mechanisms that yield control of foreign exchange for the leadership, which allows them to buy the support of the elite that makes up its power base and throw some crumbs to the rest (in dissident circles the crumbs are known as la jabita, la merienda and la propina). The other one is rejecting mechanisms that provide permanent and independent access to wealth creation for anyone who is not a member of the nomenklatura, and even to some who think they are members. The end of February 1999 brought a law, promulgated by the Cuban government, designed to eliminate the little political space that existed for internal dissent. Not surprisingly this law, which is known in Cuba as “La Ley Mordaza.” played a role in leading to the recent condemnation of Cuba’s human rights violations by the United Nations. 1. 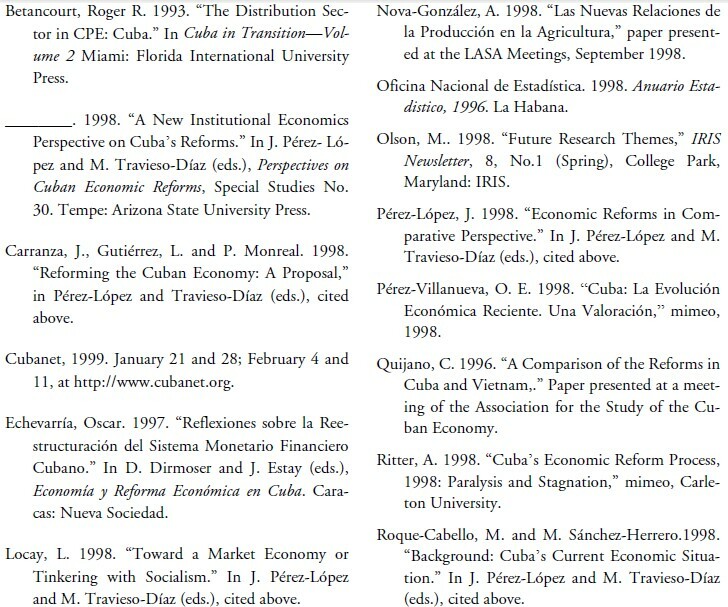 I would like to thank Jorge Pérez-López for access to his wonderful library on Cuban economic issues and L. Locay, E. Hernández- Catá and A. Linde for their comments. Earlier versions of this paper were presented at Shaw Pittman Potts & Trowbridge’s Transition Workshop on Cuba and at the IX Annual Meetings of ASCE. Support from the IRIS Center is gratefully acknowledged, while claiming exclusive property rights to any errors and omissions. 2. For a detailed discussion of this issue see Betancourt (1998). 3. For a comparison of the announced reforms in Cuba and Vietnam see Quijano (1996); for a comparison of the reforms in Cuba and China see Pérez-López (1998). 4. Variants of this argument have been put forth by others as well. In particular see Locay (1998), who evaluated the reforms as they existed in 1995 and whose interpretation seems to have been borne out by subsequent events. 5. A recent discussion of their situation can be found in Nova González (1998). 6. If the intent of the restriction is to prevent these markets from growing because it threatens the hold on power of the regime, it makes sense from this limited viewpoint; if the restriction has some other aim supposed to be consistent with the growth of these markets, it is a revelation of profound ignorance on how these markets evolve. The first interpretation is far more plausible than the second. 7. Incidentally part of that supply is extracted from the UBPCs, which lowers their incentives to produce.